Homemade mounds or boutny bars! These Homemade Bounty Bars are SUPER easy to make and only require 3 ingredients! Follow the simple step-by-step instructions from Not Enough Cinnamon to make this popular candy bar at home! Chocolate + sweetened condensed milk + shredded coconut. That’s right, 3 ingredients are all you need to make delicious yet super simple Homemade Bounty Bars aka. Mounds. 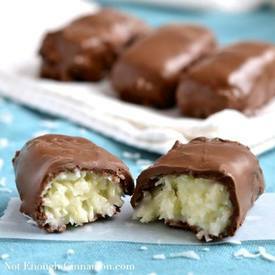 Want Homemade Bounty Bars? Use milk chocolate. Want Homemade Mounds ? Use dark chocolate instead. Making candy bars from scratch is as simple as that!